Life is an experience and Menton is the experience of a lifetime. The brightness of the light, the fresh air, the palm trees, and lemon groves are a delight. Sunny Menton bears the nickname “Pearl of France” rightly. The most Italianate and the warmest town on the French Riviera host the Mediterranean and Arab Countries Arabian Horse Championship from 01. – 02.July. This international show has become a major event not only on the French Riviera but also for the whole Arabian horse community. The celebration attracts countless Arabian horse enthusiasts worldwide while the most famous and prestigious stud farms compete with their precious horses. Set on the French-Italian border between the Italian Riviera and Monaco, Menton is the gateway to the glamorous French Riviera. The city enjoys an exceptional near-subtropical microclimate with mild winters and hot summers due to the protection of the Alps. 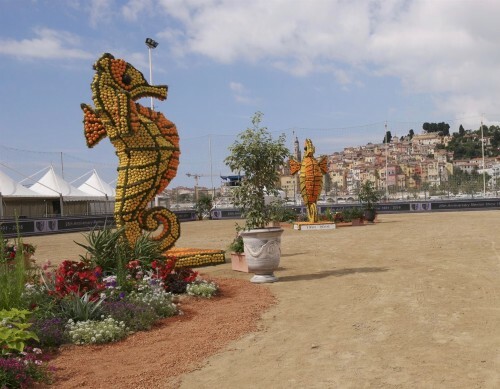 This climatic condition is favourable to the culture of citrus fruit, which explains why the Mediterranean and Arab Countries Arabian Horse Championship showring at Stade Rondelli at the Avenue Porte de France is garnered with a sea horse built out of lemon fruits. For most of the year the French Riviera town of Menton is a sleepy and tranquil place but every year the town shows a real zest for life when it becomes the host of the Mediterranean and Arab Countries Arabian Horse Championship every year since 1991. On Saturday, 01.July the show will start at 2 pm CET – celebrating the beauty of the fillies and mares. There is plenty of time for a walk down the boulevard Garavan, which has been completely resurfaced in mosaics by Portuguese artisans before the show. The views are breath-taking and the elegant villas are incomparable. When the show stops on Saturday evening around 8 pm, enjoy a glass of Prosecco with white peach juice, a speciality of the area, in one of the many bars in the Saint Michel area. The show will continue on Sunday morning, 02.July at 9 pm with the yearling colts. The highlight will be – of course – the championships. This show became inescapable and all the Gotha of the Arabian horses will meet. The curious and enthralled spectators can expect a tough competition. Al-Khashab Stud, Kuwait, will compete with two beauties. Another Kuwaiti Stud, Asayel Arabians, will send their magnificent senior stallion to compete for Gold champion honours. A global player like Dubai Arabian Horse Stud, UAE, will send young though competitive horses garnering for gold. Among their show-string is the reigning 2016 ANC and World Gold Champion Yearling Filly, D Ajayeb. The RFI Farid daughter will come to add the Menton Gold Champion Junior Filly to her list – after garnering Gold in Menton as a yearling. One of the smaller UAE farms is Al Shiraa Arabians, but they hide precious treasures. Some of them – at least – will travel to Menton; it will be a treat to the sight! A delight diva and a certain seduction will step into the ring for her proud owner Alsayed Stud, KSA. And so will do a fleabitten darling like Shirin By Aisha for Athbah Stud, KSA. Al Baydaa Stud, known for exclusive Straight Egyptian Arabian bloodlines, will compete with an exquisite filly - a silver winner at prestigious shows already. Now its time for Gold! Be prepared to be charmed by the charming, delicate fillies of Aljassimya Farm, Qatar, which will make their debut on European soil. More Qatari farms will compete, among them Al Nasser Stud, sending their glamour girl. Or Al Thumama Stud, sending a tempting bay for a flirt with spectacors and judges. And in the exciting stallion classes? Well, the power of the sword is shining bright in the stallion classes and the legend of Excalibur is going to Menton for Gold! Do you remember when the last Straight Egyptians made an impact in Menton? This year there will be some amazing individuals; Giacomo Capacci Arabians, IT, Al Rashediah Stud, KSA, will ensure it. Quality is never an accident; European breeders like Ses Planes, Spain, or Hanaya Stud, Switzerland will prove this. Jadem Arabians, Belgium, is going to support several partners, like Aria Partners, USA, and will be present by hauntingly beautiful horses. Arabian Horse Global Network is going to cover this extraordinary event and offers an unrivalled service – video coverage, results, photos, interviews, and blog posts; this service is powered by our sponsor Aljassimya Farm.